The manager of our restaurant is close personal friends with Joe Paopao, the Throwin’ Samoan. He used to come home at lunch bruised and battered from running patterns for him in the street. Our manager drawls his vowels, and flattens them, like the peaks of things threaten him. He lives on the west coast, where the mountains are worn down by time and rain and broken dreams, and the view just up the street goes out and out and out all the way to Hawaii. Is it any wonder he’s afraid of sharp, front-formed vowels? The Nipper is the age I was the first time I set foot in the Pacific Ocean. I walked hand in hand with my grandmother, both of us skin and bone, dry burlap over wooden coat hangers – me from whooping cough (also, pertussis), she from lung cancer. She would be dead five too-short years later, and I would be wondering who would lead me staunchly into the rest of my life. I would curl inward like a dry leaf, my heart a bolus, my throat constricting so tightly my breath seared it through and through. 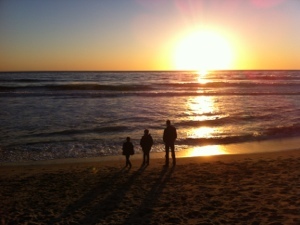 But tonight, our boys, bursting toward salt water, smiles bigger than the sunset – tonight our boys remind me that although I have lost, the nature of love, mysterious and deeply terrifying, is to love all the more. Because tomorrow, Nama will be the same as she was the day she died. She will be the same as she is in every memory I have. But tomorrow, our boys are new people again, beginning the journey to becoming young men. Even though they sometimes still need to hold my hand. Thanks for sharing these moments and memories.